A new study has found that the occurrence of advanced forms of a diabetic eye disease remains low among children living with diabetes, regardless of how long they have had the disease or their ability to keep blood sugar levels controlled. Researchers are therefore recommending that most children with type 1 diabetes delay annual diabetic retinopathy screenings until age 15, or 5 years after their diabetes diagnosis, whichever occurs later. Their findings were published online today in Ophthalmology, the journal of the American Academy of Ophthalmology. It is well established that early detection and timely treatment of diabetic retinopathy reduces vision loss in adults, and some physician organizations recommend screening children for diabetic retinopathy annually starting at an early age - after age 9, or from 3 to 5 years after diagnosis. However, the value of screening children has not been clearly documented and the prevalence of severe diabetic retinopathy among the young has been unclear. Researchers based at The Children’s Hospital of Philadelphia and the Scheie Eye Institute, Perelman School of Medicine at the University of Pennsylvania began to question current diabetic retinopathy screening guidelines for children. They were concerned that these annual exams may create an excessive financial and logistical burden for families and the health care system. The researchers conducted a retrospective study of 370 children under age 18 with type 1 and type 2 diabetes. Some of the study participants had blood sugar levels three times that of a person without diabetes. All had received at least one diabetic eye disease screening exam between 2009 and 2013, but none were found to have diabetic retinopathy. The researchers then examined the data that led to the current screening guidelines. They discovered that previous studies reported a diabetic retinopathy prevalence rate between 0 and 28 percent among children studied, but the majority of the cases were very mild and thus would not qualify for treatment. 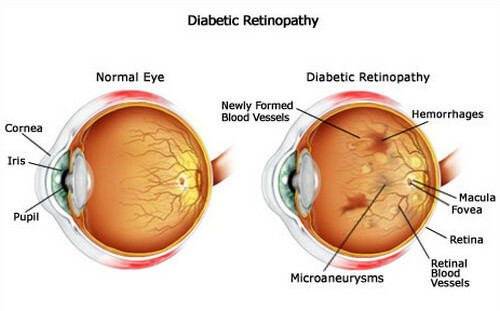 They also found that the youngest person reported to have severe diabetic retinopathy was between 15 and 19 years old, and 5 to 6 years was the shortest reported duration of having diabetes before developing severe diabetic retinopathy. In light of the available evidence, the researchers recommend that screenings for children with type 1 diabetes could begin at a later age than previously recommended. Diabetic retinopathy screening for children with type 1 diabetes should start later" align="right" /> Researchers say exceptions should be made for children with type 2 diabetes and those identified by their endocrinologists as having high risk for diabetic complications. They should start diabetic retinopathy screenings upon diagnosis, similar to adults with type 2 diabetes, since many type 2 diabetes patients live with the disease uncontrolled before they are diagnosed. Because there is limited published researched on children with type 2 diabetes and diabetic retinopathy, researchers noted that a retinopathy screening examination upon diagnosis is their recommendation for those patients until additional data showing otherwise is available. Diabetic retinopathy is the leading cause of blindness among working-age adults in the United States and affects close to 8 million people. The American Academy of Ophthalmology currently recommends that people with type 1 diabetes have annual screenings for diabetic retinopathy beginning 5 years after the onset of their disease, and that those with type 2 diabetes should have an examination at the time of diagnosis and at least once a year thereafter. The American Academy of Ophthalmology, headquartered in San Francisco, is the world’s largest association of eye physicians and surgeons, serving more than 32,000 members worldwide. The Academy’s mission is to advance the lifelong learning and professional interests of ophthalmologists to ensure that the public can obtain the best possible eye care.The Academy is also a leading provider of eye care information to the public. The Academy’s EyeSmart® program educates the public about the importance of eye health and empowers them to preserve healthy vision. EyeSmart provides the most trusted and medically accurate information about eye diseases, conditions and injuries. OjosSanos™ is the Spanish-language version of the program. Ophthalmology, the official journal of the American Academy of Ophthalmology, publishes original, peer-reviewed, clinically-applicable research. Topics include the results of clinical trials, new diagnostic and surgical techniques, treatment methods, technology assessments, translational science reviews and editorials.